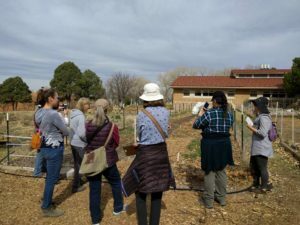 EEANM Book Club visited the Desert Oasis Teaching Garden at Albuquerque Academy on February 11. Although it was winter, there was plenty to see and we learned about many of the techniques employed at the Desert Oasis Teaching Garden including permaculture (sustainable design principles in agriculture), vermiculture (using worms for composting), and growing methods for edible plants and plants that restore landscapes. Karen Temple-Beamish, Sustainability Coordinator at Albuquerque Academy was a wonderful host for this visit and I think we all went home and started spring prep for our own gardens. Our next EEANM Book Club Adventure will be a trip to Cottonwood Gulch Base Camp on April 29!